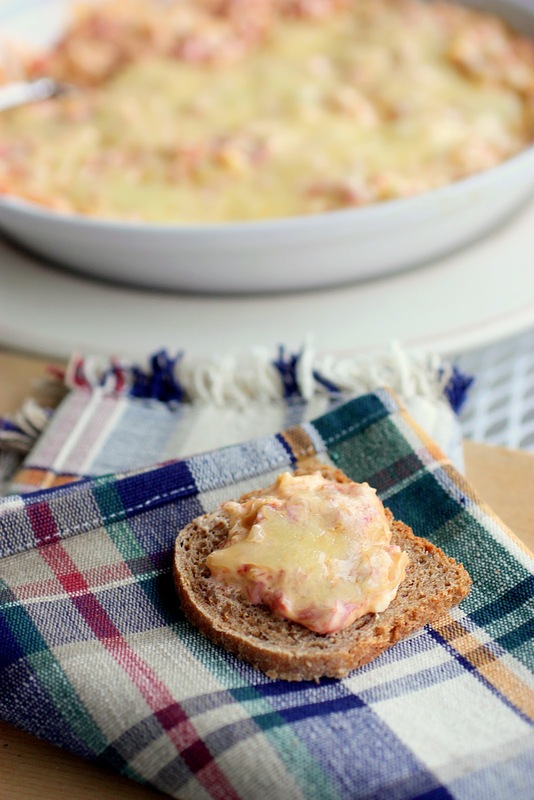 This Hot Reuben Dip with layers of corned beef and sauerkraut is perfect for St. Patrick’s Day. I know that this Hot Reuben Dip isn’t for everyone, but if you love corned beef and sauerkraut you will love this. Thanksgiving and Christmas are holidays that are always filled with food that I look forward to all year long. St. Patrick’s Day, on the other hand, has always left me wanting in the food department. I’ve never been too excited about corned beef and sauerkraut but I try to keep an open mind about food. My husband is obsessed with Reuben sandwiches so when I saw this dip I thought it was a sure bet to earn some points with my hubby. I’ve actually never had a Reuben sandwich but my husband and friends we had over for game night vouched that it tastes just like one. I will warn you this may be the ugliest dip you ever make. I take that back. It ties with our beloved Buffalo Chicken Dip for the ugliest dip I’ve ever made. BUT it has a lot of personality and flavor to make up for it. Just know that the men will love you for it on St. Patrick’s Day…because they won’t care what it looks like. This Hot Reuben Dip with layers of corned beef and sauerkraut is perfect for St. Patrick's Day. 2. In a large bowl mix together the cream cheese, 1 cup of Swiss cheese, the dressing and chopped corned beef. Spread in a pie plate or other shallow serving dish. Top with the sauerkraut and the remaining ½ cup of Swiss cheese. 3. Bake for about 15 minutes, or until bubbly around the edges. Serve on cocktail-size rye bread squares. Notes: Just ask your deli for sliced corned beef then give it a chop before you add it to the dip. Has anyone done this recipe in a crock pot? Thinking of adding ingredients and then warming up in the crock pot. What size crock pot would you suggest? I think a small 4 quart crockpot would work the best! I made this today for our church supper and it was a HUGE hit! There was barely any left and I doubled the recipe!! I couldn’t find any cocktail rye so I used fresh Rye, sliced it in dipping size and lightly toasted it while the dip was baking. This will surely be on my March recipe list from now on! Yay. Glad you loved it! You know, here in Ireland, we don’t have corned beef and cabbage on Paddy’s Day. We have normal dinner, maybe a Sunday roast (beef or ham), or if we’re lazy, fish and chips from the chipper. This is after the really long walk, of course. Paddy’s Day is for really long walks. I make this same dip and love it!!! Beauty is in the eye of the beholder…and that looks amazing! Hot dips are the best! Great recipe. This is different. I made Reuben sandwiches recently but this may have to be next recipe when Reuben’s are requested! So this just moved to the top of my to bake/cook list! I love dips and am always looking for different ones…and I’m crazy and actually love sauerkraut and all things ugly 🙂 thanks for sharing! This sounds fabulous ~ my favorite sandwich in a dip!